Multiple myeloma (MM) is a plasmocytemalign a n t p roliferative disease [1,2]. It causesdysplasia of clonal plasmocyte in marrow, bringsthe secretion of monoclonal immune globulinor its fragment (M protein), inducing relatedorgans or tissues lesion. MM has a diversity ofclinical features such as anemia, ostealgia, kidney failure, infection, hemorrhage and so on , so they result in misdiagnosis easily, thus laboratoryexaminations are very essential fo r differentia ldiagnosis. Now we will introduce a typical caseof MM with a special blood sample. Multiple myeloma (MM) is a plasmocyte malignant proliferative disease [1,2]. It causes dysplasia of clonal plasmocyte in marrow, brings the secretion of monoclonal immune globulin or its fragment (M protein), inducing related organs or tissues lesion. MM has a diversity of clinical features such as anemia, ostealgia, kidney failure, infection, hemorrhage and so on , so they result in misdiagnosis easily, thus laboratory examinations are very essential for differential diagnosis. Now we will introduce a typical case of MM with a special blood sample. July 30th, 2016, clinical laboratory in emergency, we received three tubes of blood sample from a patient for blood routine test, biochemistry test and thrombotest. The last two tubes were centrifuged to get serum and plasma separately. While an erratic phenomenon occurred: the sample for biochemistry test couldn’t be centrifuged to obtain serum successfully, which contained a separating gel but no anticoagulation, there was little serum but too much haematocyte. On the contrary, the one for thrombotest which contained anticoagulation of potassium citrate got too much plasma but little haematocyte (Figure 1A). In addition, the blood routine test showed the hemoglobin was only 55g/L, which revealed severe anemia. So it seemed inconsistent from the data above. More data were needed to make diagnosis. Figure 1a: Three tubes of blood sample. Tube A for biochemistry test, with separation gel but no anticoagulation. Tube B for thrombotest, with anticoagulation of potassium citrate. Subtitute tube C for biochemistry test, with nothing in it. There was little serum but too much haematocyte in tube A, while too much plasma but little haematocyte were separated in tube B and C.
A 60-year-old male presented to his physician on July, 30th, 2016 complaining of fatigue, generalized weakness, dyspnea upon minimal exertion for one year, which was aggravated with dizziness in the late month. His vital signs were as follows: blood pressure 129/82 mmHg, pulse 82/min, breathing 20/min, body temperature 36.4°C. Routine laboratory values of major significance revealed hemoglobin levels of about 5.5 g/dL (reference 11-16) and his platelets count at 102,000/mL (reference 100,000-300,000/ mL) (Figure 1B). 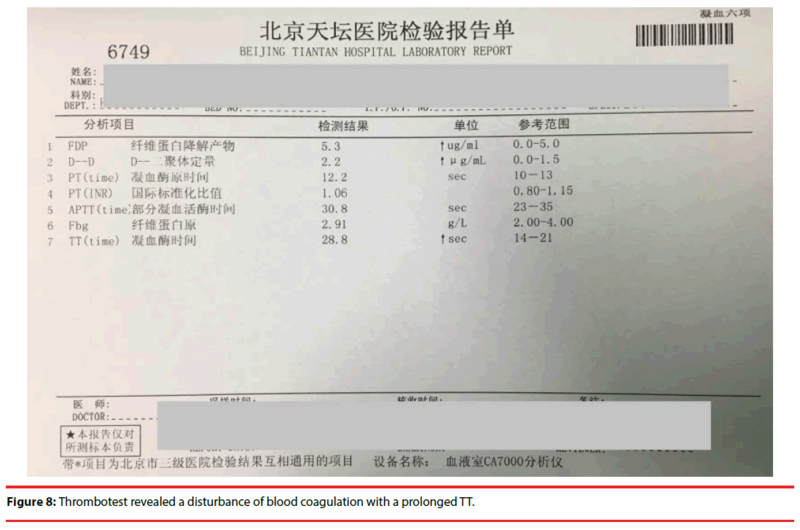 The patient was referred to the emergency department at Capital Medical University, Beijing Tiantan Hospital for bone marrow biopsy and a hematology consult. Upon admission, it was noted that his blood samples were weird as showed above. 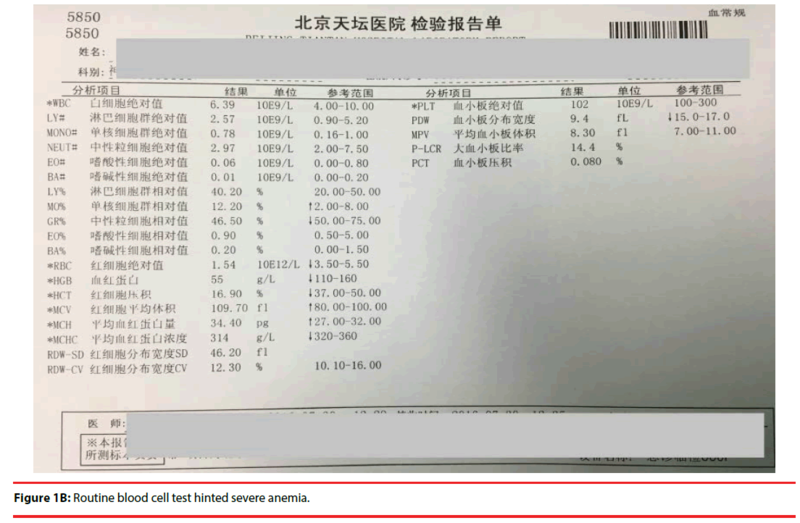 Figure 1b: Routine blood cell test hinted severe anemia. After discussion, we decided to use a blank tube for biochemistry test as we couldn’t get serum successfully using the tube containing separation gel. It was useful! The results were as follows (Figure 2): the total protein (TP) and globulin (GLB) levels were elevated to 123g/L (reference 60-80) and 95.3 g/L (reference 20- 30), the albumin(ALB) level was decreased to 27.7 g/L(reference 35-55). On the next day the results of serum protein electrophoresis revealed the levels of albumin, globulin of Alpha1a,β 1and β 2 decreased, while γ globulin increased to 47.3%( reference 10.3-18.2),A/G ratio was 0.54(reference 1.10-2.40) (Figure 3). Further test for immunoglobin level was as follows (Figure 4). IgE 4.63IU/ml (reference 0-200), IgG84.10g/L( reference 7-16),IgA0.23 g/L( reference 0.7-4) ,IgM 0.18 g/L( reference 0.4-2.3). Figure 2: Results of biochemistry test. High level of TP and GLB, low level of ALB. The A/G was in inverse ratio. Figure 3: The results of serum protein electrophoresis. There was a sharp wave in γ globulin region. Figure 4: Results of immunoglobin level. The IgG was 84.10g/L, exceeding the normal level several times. According to the test results above, we made a primary conclusion that the patient may be attacked by the disease of MM. In order to make clear the type of the disease, we detected M protein with the method of immune electrophoresis; the result revealed that the type of M protein was IgG/Kappa (+) (Figure 5). 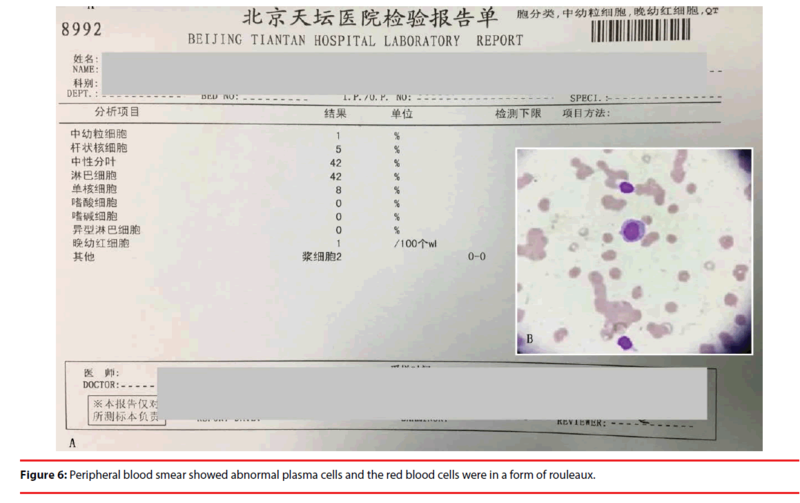 At the same time, a peripheral blood smear revealed abnormal plasma cells and a 42% distribution of lymphocytes, with 2% being plasma cells (Figure 6A, 6B). Additionally the results of the bone marrow biopsy revealed a Grade II hyper cellular marrow and 68.5% plasma cells, while only 14.5% granulocyte and 8.5% erythrocyte (Figure 7). Given all of the above information, a definitive diagnosis of MM was made. Figure 5: Immune electrophoresis. The type of M protein was IgG/Kappa (+). Figure 6: Peripheral blood smear showed abnormal plasma cells and the red blood cells were in a form of rouleaux. 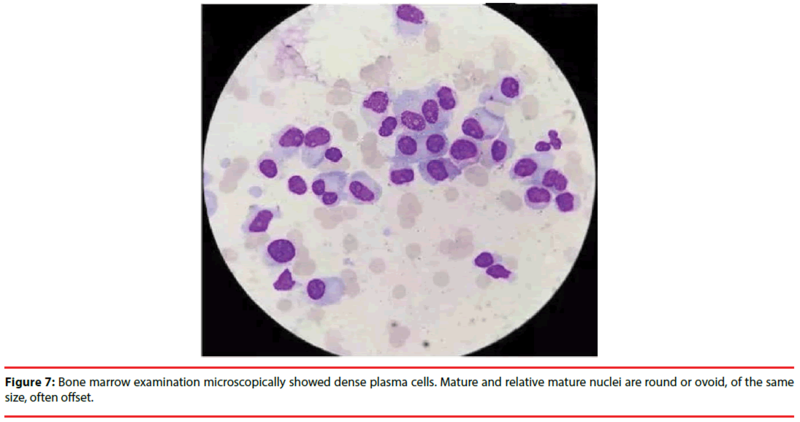 Figure 7: Bone marrow examination microscopically showed dense plasma cells. Mature and relative mature nuclei are round or ovoid, of the same size, often offset. MM is a primary plasma cell malignancy characterized by extensive osteolytic destruction. It has an incidence of 4 of 100,000 habitants/ year in the Western World with a male to female ratio of 1.6: 1 [2,4]. Most patients are more than 40 years old. MM is characterized by abnormal proliferation of bone marrow plasma cells associated with monoclonal immunoglobulin or light chain (M protein) over-generation. As MM usually has a chronic onset with atypical symptoms at early stage, so it was easily misdiagnosed. MM has a diversity of clinical manifestations such as anemia, bone pain, kidney damage , bleeding, neurological symptoms, hypercalcemia, amyloidosis and so on. As the formation of normal immunoglobulin is inhibited, so the patients are prone to a variety of bacterial infections. As showed above, this case we reported presenting with fatigue, generalized weakness, dyspnea upon minimal exertion and left shoulder pain of three-months duration, had nose bleeding four times with no obvious risk factors two weeks ago, which was hard to stop. Clinical examinations were as follows: anemic countenance, cadaverous eyelid conjunctiva and breastbone with no pain. Lung breath sounded clear with regular heart thythm, and abdomen was plain and soft with no tenderness. As mentioned at the start, blood sample tubes that contain a separating gel are often used to obtain blood serum for laboratory tests. After centrifugation, the inert acrylic gel at the bottom of the tube normally occupies the middle position between the cells (clot) and the serum, as its density is intermediate between theirs. The gel then serves as a barrier to diffusion, preventing contamination of the serum with cellular components. The reason for the failure of obtaining serum despite correct centrifugation may be as follows: there was a lot of globulin in the blood, which was a kind of macromolecule with large diameter, as it couldn’t pass through the separation gel, serum couldn’t be separated successfully. But some people had different opinion: Maire B considered hyperproteinemia made the serum denser than the separating gel, which therefore lay on the top of the serum fraction during centrifugation . Thus it gave us a false appearance that there was too much erythrocyte as if the patient suffered from the disease of polycythemia. But in fact the hemoglobin concentration was very low, only 55g/L. So there was, in fact, no conflict. As the body produces a large number of invalid immunoglobulin, which can increase blood viscosity, so thrombosis occurs. At the same time, the abnormal immunoglobulin can be wrapped in the surface of platelets and coagulation factors, affecting the formation of blood clots, which induces human bleeding . That was why the patient had nose bleeding hard to stop with a longer thrombin time of 28.8 seconds (reference 14-21) (Figure 8). Hyperglobulinemia can also result in an increase of ESR. This case showed a high ESR of more than 140mm/60min (reference 0-15). As globulin has a positive charge, it can promote the aggregation of erythrocyte and accelerate ESR by neutralizing the negative charge on the surface of the red blood cells . In many cases, as the clinical symptoms and signs are not typical, misdiagnose always occurs. Patients were often admitted in respiratory ward, renal ward or orthopaedic ward besides hematology ward due to hemoptysis, proteinuria or bone fracture. Figure 8: Thrombotest revealed a disturbance of blood coagulation with a prolonged TT. This phenomenon is seen in very advanced cases of myeloma; as an iatrogenic effect after the administration of iodinated radiologic contrast media; and in dialysis patients, when blood is taken from catheter systems in which a concentrated sodium citrate solution is used as a blocking solution. This case reminds us to consider multiple myeloma whenever this phenomenon is seen .Then we can do further test of M protein to make a definite diagnosis, thus it can be seen laboratory diagnosis plays a very important role during the diagnosis of some diseases. Laboratory and clinical diagnosis have both division and cooperation during the diagnosis and treatment of diseases. Our laboratory workers are more likely to get the first hand data than the clinician. If we can discover problems in our daily life, communicate with doctors and nurses actively, propose further checks, and finally find the answers following the clues, not only the patients can get diagnosis and treatment as soon as possible, but also we have a sense of achievement. Rajkumar SV, Kumar S. Multiple myeloma: diagnosis and treatment. Mayo.Clin. Proc 91(1), 101–119 (2016). Dash NR, Mohanty B. Multiple myeloma: a case of atypical presentation on protein electrophoresis. Indian J. Clin. Biochem 27(1), 100–102 (2012). Williams GD, Kadaria, Sodhi A. Concurrent myelomatous pleural effusion and extramedullary mediastinal involvement as an initial manifestation of multiple myeloma. Am. J. Case Rep 17(1), 472–475 (2016). Ribeiro IS.Hematologia da Pratica Clinica à Teoria. Lidel, Lisboa (2015). Mariana Alves , Raul Moreno, Fatima Rodrigues, et al. Hematuria as the first sign of multiple myeloma. Clinical. Case. Reports 5(8), 1358–1361 (2017). Maire B, Schlüter K. A problem with the separating gel in a blood sample tube in a patient with multiple myeloma. Dtsch. Arztebl. Int 114(1), 507 (2017). Li Wen-ke, Li Wen-qian,Feng Jian-ming, et al．Clinical significance of determination of C-reactive protein, hemoglobin, erythrocyte sedimentation rate in the different stages of patients with multiple myeloma. Journal. Of. Leukemia & Lymphoma 21(3), 167-170 (2012).